If you didn’t get your fill of ‘The Guardians of the Galaxy‘ and are finding it hard waiting until 2017, you can satisfy your craving a little sooner, if you don’t mind your heroes animated, that is. Disney XD announced the series last year at Comic-Con and have been working diligently towards that with a first-look at a poster and a teaser, it’s just a few seconds, but it shows the groundwork for what will be an exciting series for young and old, alike. 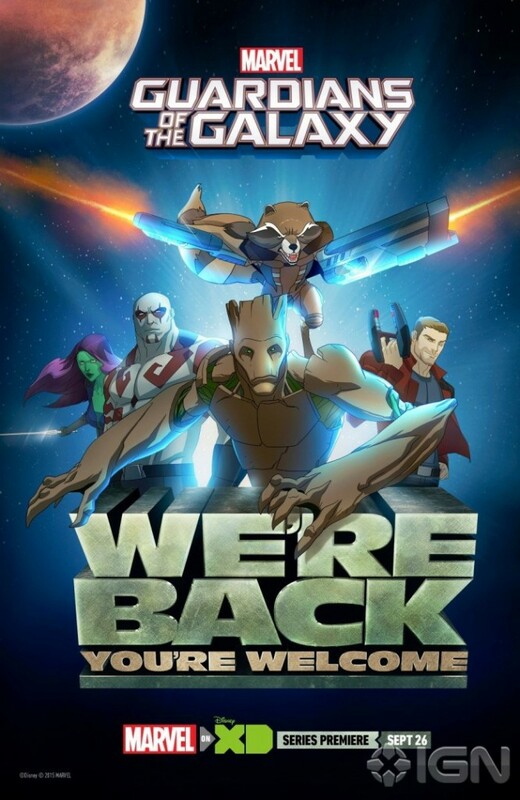 ‘Guardians of the Galaxy’ officially debuts Saturday, September 26 with a pair of back-to-back episodes airing during peak viewing times that evening. However, you can get a sneak peek at the first episode a few weeks earlier on Saturday, September 5. If that’s not enough, Disney will launch a series of character shorts to familiarize viewers with the main players, which will air throughout August on Disney XD. The series follows Peter Quill who finds an unknown artifact keyed only to his DNA. Upon opening it, a treasure map leads to the Cosmic Seed, an incredibly powerful weapon which holds the ability of creating the next universe. The Guardians are responsible to find, protect and ultimately destroy the weapon in order to secure it from those who would abuse it’s power namely, Thanos, the Collector and the Grandmaster, a resurrected Ronan, and even to Loki in order to secure the universe. The cast voicing the characters we’ve come to know are Will Friedle as Peter Quill, Trevor Devall as Rocket Raccoon, Vanessa Marshall will be Gamora, David Sobolov as Drax the Destroyer, Kevin Michael Richardson as Groot and James Arnold Taylor as Yondu and Cosmo. 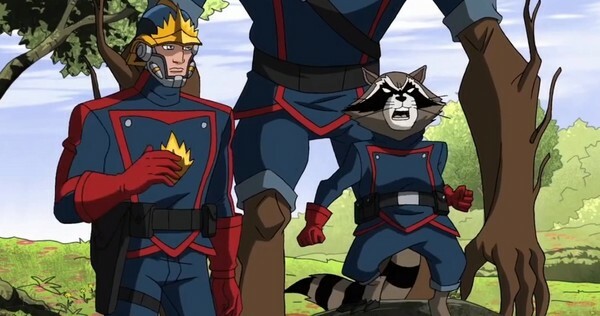 We’ve been given the synopsis of the first two episodes as well as the teaser, of course, anything that occurs in this cartoon is NOT part of the MCU, but it should be enjoyable, regardless. “Road to Knowhere” – The newly-christened Guardians of the Galaxy come into possession of a dangerous artifact that has Thanos’ new lieutenant, Korath, after them. “Knowhere to Run” — The Guardians struggle to subdue the suddenly-sprung-to-life Celestial head that is the Knowhere space colony, as well as storm Korath’s ship to rescue Quill, Gamora and the mysterious CryptoCube that holds the Cosmic Seed. ‘Big Hero 6’ Heading to Disney XD as Animated Series!!! This entry was posted on Wednesday, July 22nd, 2015 at 10:40 pm	and is filed under Comics, Film, News, Television. You can follow any responses to this entry through the RSS 2.0 feed. You can skip to the end and leave a response. Pinging is currently not allowed. « Check Out Marvel’s Cinematic Universe: Phase Two Collection!! !